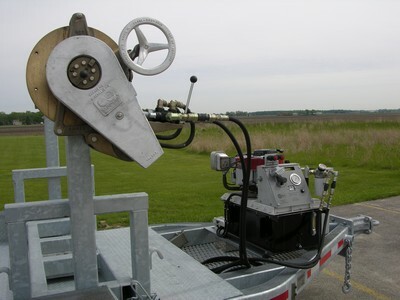 Tensioning Brake & Take-up Retriever - Sauber Mfg. Co. Precision braking is guaranteed to be smooth and controlled by our patented ventilated bronze disc braking system. Components are modular for easy serviceability. Our versatile Take-Up Retriever fits any Sauber brake without modification. This enhancement is designed to pull through short spans of new conductor and salvage wire. 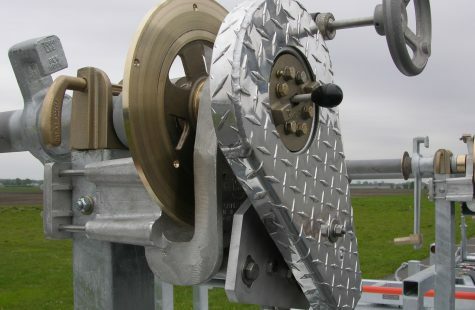 Optional hydraulically activated calipers are ideal for remotely controlling braking tension on elevated platforms. 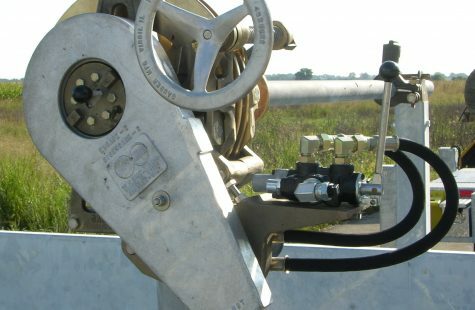 Multiple reels can be controlled from a single operator’s station. 12" Ventilated bronze disc outperforms other solutions with rust free materials and 700 ft-lbs of torque. 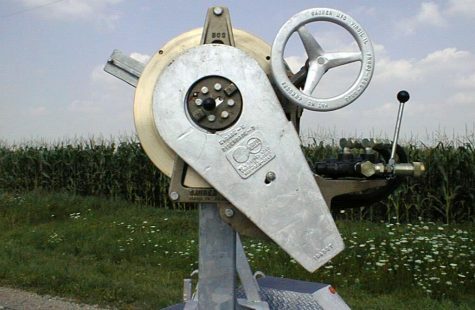 Ideal for precise overspin control or moderate tension into a bull wheel application. 2600 ft-lbs torque @ 2250 PSI. Full feathering, bi-directional valve provides 17 RPM @ 8 GPM. Single lever MG-Bronze hub disengagement from braking unit when not required. Nothing to disassemble. Holds line tension and dumps to tank in neutral. 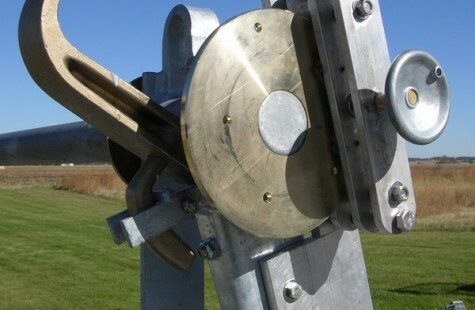 Reel bar extension provided for attaching Capstan Coupler. MG-Bronze motor housing and Almag chain cover. 71 lbs.